CRUNCH: This week Time Magazine's Techland.com looked at why on earth Hollywood are overlooking great comic logos, in favour for basic font derived mastheads for their comic book adaptations. And you know what? It's a darn good question. CRUNCH: Deadpool - the only place Marvel's Merc with a Mouth isn't, is on jars of Peanut Butter - but that's easily remedied. Keeping the wise-cracking Wade Wilson at the top of the talk about list, the fact Fox is possibly looking at Robert Rodriguez to direct the Deadpool movie, and this little video clip formally revealing him as a character in Marvel Vs Capcom 3 by pitting him against Dante from Devil May Cry. 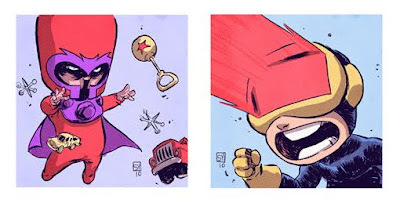 CRUNCH: On a much lighter note, the pretty much without peer Skottie Young, has posted up the X-Baby art he did for the Heroes Con badges this year, over on his blog. Done by a guy who could illustrate the phone-book and make it look an interesting read, you can see the rest of the minute mutant collection right after the jump.